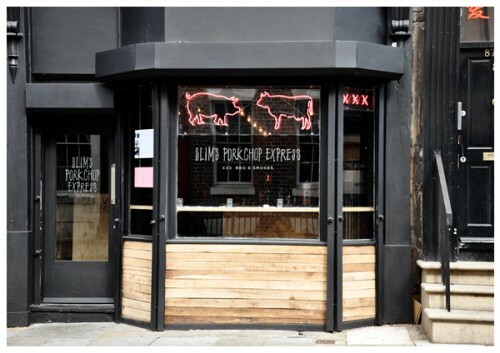 We’re absolutely delighted that Slim’s Pork Chop Express have opened their doors on Seel Street, Liverpool and are rapidly becoming a firm favourite in the city centre. 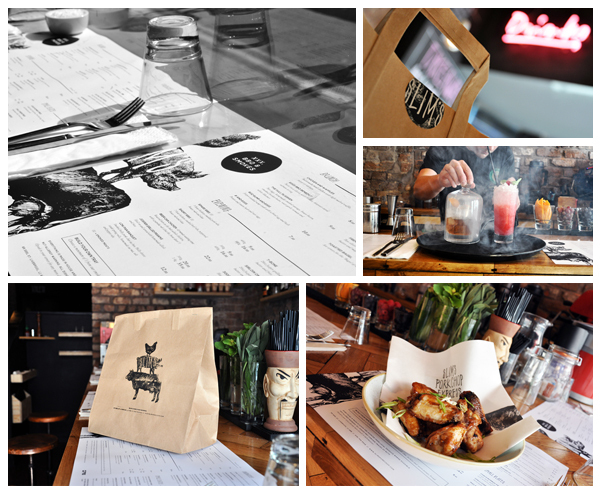 Having already worked with the team on their other venues, Santa Chupitos and Salt Dog Slims, igoo were approached to create the identity for Slim’s Pork Chop Express and to produce a variety of different elements within the restaurant. We began by developing a full custom font and created a hand-drawn illustration of a chicken, pig and a cow, which would make up their final logo design. The inspiration for the restaurant came from the cult film, ‘Big Trouble in Little China,’ which is a big favourite of the Slim’s team and elements of this has been carried throughout the branding. The food menus, featuring the chicken, pig and cow logo, also double as placemats and boast a huge selection of mouth-watering dishes. To contrast with the monochrome design, highlights of pink have been used in the drinks menu and throughout other elements of the restaurant. Takeaway packaging was a big part of the brand identity so we developed a stamp (complete with animal logo), along with custom stickers, which will feature on all takeaway boxes, bags and cups. 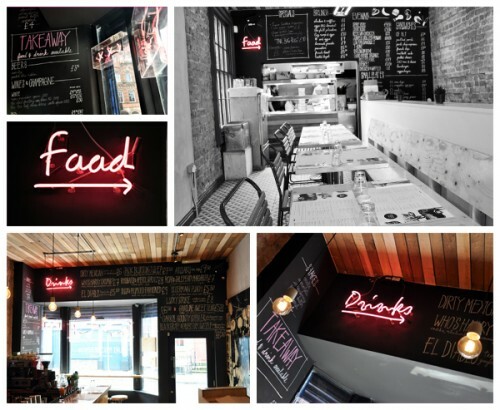 Their full food and drinks menus have been hand-drawn onto the walls inside the restaurant, by igoo’s Amee, using the Slim’s font and are regularly changed to reflect the current available options. We have also designed a selection of neon signs, which are featured in the windows of the restaurant and above the food and drink menus on the walls. The neons were custom made using both our hand-drawn font and outlined images of the featured animals. One of our favourites elements of the branding is our hand-illustrated mural, inspired by the film, Big Trouble in Little China. Aspects of the brand were incorporated into the design, with the main characters adopting heads of a chicken, pig and a cow. It was important to reflect the spirit of the city and include references to Liverpool within the artwork, so the mural includes key buildings such as the Chinese Arch and The Liver Buildings- we recommend taking a closer look to spot all of the little intricacies. Five weeks of detailed drawing (and a very tired hand later!) the completely unique wall art is the centre piece of the fantastic new venue. 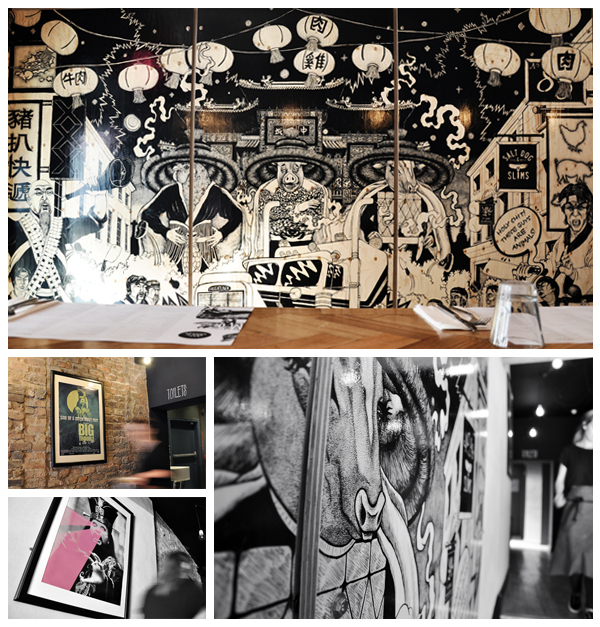 Additional walls also feature several hand-picked pieces of framed artwork, which focus on key scenes from the film. We absolutely loved working with the Slim’s team on the project and look forward to collaborating with them again in the future. In the meantime, we would urge you to check out Slim’s Pork Chop Express for yourself- we guarantee you won’t be disappointed.